Claudio Véliz adopts the provocative metaphor of foxes and hedgehogs that Isaiah Berlin used to describe opposite types of thinkers. Applying this metaphor to modern culture, economic systems, and the history of the New World, Véliz provides an original and lively approach to understanding the development of English and Spanish America over the past 500 years. According to Véliz, the dominant cultural achievements of Europe's English- and Spanish-speaking peoples have been the Industrial Revolution and the Counter-Reformation, respectively. These overwhelming cultural constructions have strongly influenced the subsequent historical developments of their great cultural outposts in North and South America. The British brought to the New World a stubborn ability to thrive on diversity and change that was entirely consistent with their vernacular Gothic style. The Iberians, by contrast, brought a cultural tradition shaped like a vast baroque dome, a monument to their successful attempt to arrest the changes that threatened their imperial moment. 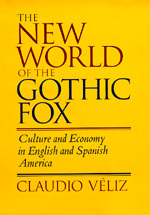 Véliz writes with erudition and wit, using a multitude of sources—historians and classical sociologists, Greek philosophers, today's newspaper sports pages, and modern literature—to support a novel explanation of the prosperity and expanding cultural influence of the gothic fox and the economic and cultural decline endured by the baroque hedgehog. Claudio Véliz is University Professor and Professor of History at Boston University.